I have heard that in Central Africa, to unite the community, the Itaru people sing until everyone feels that true harmony is reached. I have heard that in Latvia, when meetings aren’t working, the people start singing. I know that singing was a major factor in dismantling apartheid in South Africa. I know that we have a lot more work to do to end oppression, and I believe it must be done singing. I have felt the air around me change, standing in the midst of singing. I have seen the look on your face when singing entered your body. I have felt your back, belly, and both sides vibrate when you were singing those bass notes. I have seen a group carried away on song. I have had my most delicious delirious deep moments singing. 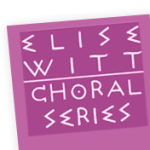 International songstress and winner of the William L. Womack Creative Arts Award, ELISE WITT has released her 12th recording on the independent EMWorld Records label. We’re All BORN SINGING is a wild departure for the Swiss-born Atlanta singer. 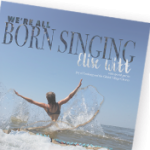 Spoken word, choral pieces, and soundscapes, join with an array of lush arrangements celebrating the power of singing to vibrate us body and soul, and bring us together as community. 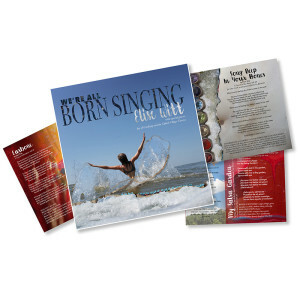 We’re All BORN SINGING was recorded in Georgia and California and was co-produced by Elise and Terry Garthwaite, from the iconic San Francisco Bay Area band Joy of Cooking. Vibraphone, octave fiddle, trumpet, sax, flute, and cross cultural percussion spice up the arrangements, and Terry adds her bluesy vocals and solid guitar rhythms to the mix. Perhaps the most alluring instrument on the CD is Brien Engel’s Glass Harp. 50 glasses sized from a giant brandy snifter to tiny shot glasses create musical magic on the songs Bees Make Honey and Amoeba. Collaboration is the name of the game for this collection of Elise’s original songs. Malcolm Dalglish’s Ooolation Singers are recorded live at Yosemite National Park on the rhythmically haunting Song Deep In Your Bones. Students from the Global Village Project, a school for teenage refugee girls in Georgia where Elise serves as Artist in Residence, are featured on I See You With My Heart, a multi-lingual musical collage, and Break the Silence, written for Eve Ensler’s One Billion Rising, a global movement to stop violence against women and girls. A portion of the sales from this CD benefit the Global Village Project. On the Radio & in the News! 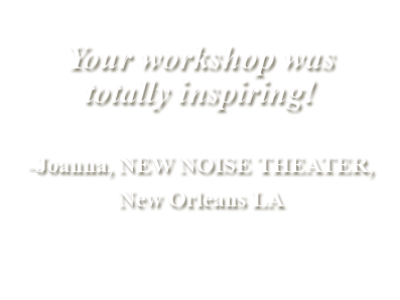 ~ Honors the notions of language and culture… Crosses the line that separates the performer from the audience… Inspires people who listen to then sing! Elise took a leap on this cd. It is theatrical as well as deeply musical, cross-pollinating all the beauty of her life’s work. It is tremendous, brave, and beautiful! What a beautiful creation! I’ve been listening, weeping and laughing, hitting repeat, and whooping in delight. 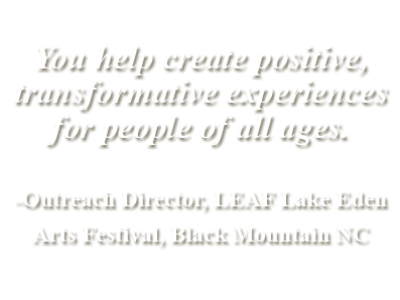 Your voice – what beautiful work you’ve done! I love how you weave the experiences, people, sounds, and notions of your life so completely in this CD. It’s all there. You’re all there! This is the album where Elise completes the transition from ‘singer’ to ‘artist,’ an appellation that is used all too frivolously… but not in this case. Well done! This album is a pinnacle of Elise’s life’s work: inspiring people to create musical community. She weaves a tapestry of voices in song, shedding light on the ethereal mysteries of dust, love, human kindness and what the world needs more of – singing! 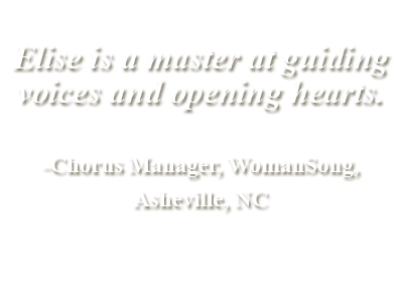 Elise’s provocative songs ask you to think, to act, to enjoy, to fully engage in life. She invites you to stretch not only your voice, but your expectations and assumptions. 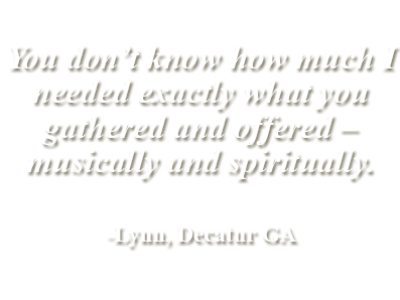 A portion of the proceeds from this recording will benefit the Global Village Project, a school for teenage refugee students in Decatur GA, where Elise serves as Director of Music Programs.